Quiet, sweetly smooth. Nut, raisin, hints of fir and flowers in aroma and cup. Softly balanced acidity, lightly syrupy mouthfeel. Round, sweet-toned finish. 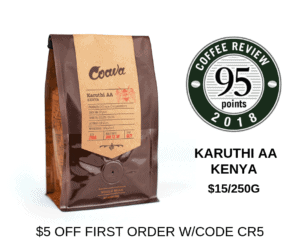 This coffee is certified organically grown and Fair-Trade certified, meaning it was produced following organic agricultural procedures and purchased from small-holding farmers at a “fair” or economically sustainable price. Doi Chaang is a single-estate coffee produced by a northern Thailand hill tribe in the Golden Triangle mountains of Thailand and roasted in Canada. The independent coffee growers receive over 50% of the profits of this unusual and pioneering venture. Visit www.doichaangcoffee.com or call 866-924-2264 for more information. Who Should Drink It: Smoothly balanced cup with an inspiring story.